It’s time to tackle the challenges of sustainable and cost-effective commercial manufacturing regarding cell and gene therapy. Cell and gene therapies have many of the same manufacturing needs as biopharmaceuticals. As a result, industry experts expect single-use technologies used in biopharmaceutical clinical trials and commercial production to play a larger role in the future development and production of cell and gene therapy. Single-use systems are already incorporated in the development of cell and gene therapies today. However, many of those single-use systems cannot be transferred from laboratory scale to commercial manufacturing for a variety of reasons including issues with: extractables, leachables, supply chain security and reproducibility. These problems will need to be overcome, and solutions developed in the near future, to meet the pace of cell and gene therapy development. As cell and gene therapy manufacturing processes evolve to meet regulatory, economic and patient safety needs, some learnings will come from bioprocessing, while others will have to emerge that are specific to cell and gene therapies. 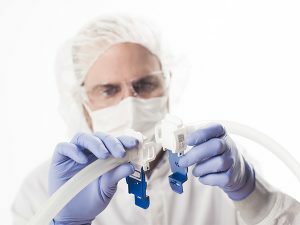 The unique requirements of the cell therapy market will have a significant impact on the future development of single-use systems, including connection technologies. As cell therapy producers gain more knowledge and better understand the requirements and variability of their processes, single-use system manufacturers will have a greater opportunity to address the specific needs of the cell therapy producers. To learn more, read our white paper “Cell & Gene Therapies: A Guide to Single-Use Connections. 10 Transferable Lessons from the Bioprocessing Industry.” This whitepaper discusses the use of single-use connection technologies in biopharmaceutical manufacturing specific to cell and gene therapies.